Kenny McLean netted from the penalty spot for the Dons. 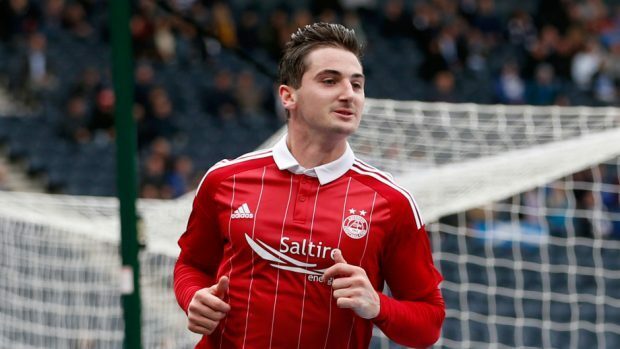 Rangers are reported to be planning a summer transfer raid for Dons midfielder Kenny McLean. It is believed that new Ibrox boss Pedro Caixinha has identified the player as one of his key transfer targets. The midfielder signed for Aberdeen in 2015 for a six figure fee, believed to be in the region of £300,000, and it has been reported that the club would demand a seven figure sum to sell the star. An official approach is expected to be made in the summer, but Derek McInnes is likely to make a move soon to tie him down to an improved deal. McLean has made 47 appearances for the Dons in all competitions this year, and he played the full 90 minutes in Saturday’s Scottish Cup semi-final win over Hibs.